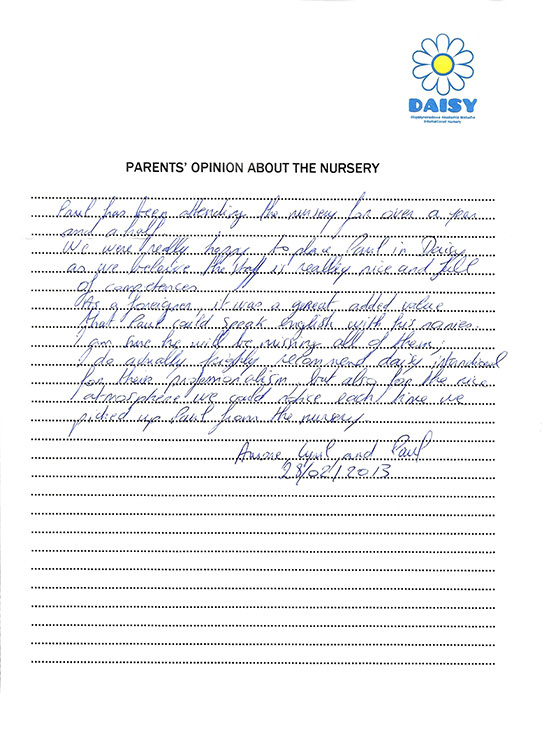 We are very fond of Karol’s stay at the Daisy Nursery. Throughout two years Karol learned a lot. From the beginning he was tough how to be independent at the Nursery, thanks to this at home he also ate by himself, dressed up by himself, cleaning after himself. The cooperation with the Teachers was problem free, very fruitful, and thanks to that Karol said good bye to his pacifier and was potty trained. Because of the constant contact with children he is outgoing, easily makes friends, he understands English. He understands loads of sentences and knows words. Throughout all this time we trusted the Teachers that took care of Karol, we liked the a lot as well as our daughter Marysia. We will be recommending the Daisy Nursery as a place, that the child not only spends good time at, but where they learn a lot and become independent. We are very happy with Samek’ s stay at the Preschool. He attended the Preschool for almost 2 last years. He learned a lot throughout this time, he made friends, discovered mountain climbing and sports’ climbing. We are very grateful for the care that was given to our son and bringing him up for a five years old. Samek had great activities at the Preschool, we are very grateful for organizing them. There were unforgettable trips. Thank you. We exceptionally keep in our memory the children’s performances on various celebration occasions, these were unforgettable moments. We strongly recommend and will recommend the Daisy Preschool to parents. Greetings and we will be staying in touch. Our son Leon attended Daisy for 1 year and 3 months. We are very happy with the care that the Teachers provided to our son. At the beginning we were full of doubts but with time we noticed that Leon attends the Nursery with pleasure, he learns new skills – he learned to taste new kinds of food, he learned colors and shapes in English. The big plus of the Nursery were the numerous additional activities, theaters, play, pictures with Nursery colleagues. Thank you for the great care we will be recommending the Daisy Nursery to everyone. All the Teachers were kind and very helpful. We have no remarks, everything great :) we are staying at Daisy Preschool. Daisy International Preschool is a very good institution. Adaś with joy came to play and learn in a home, family atmosphere in a small group. The aunties that take care of the children were extremely kind and professional, playing with children from all over the world gave the chance to naturally learn how to use the English language in everyday life. We are very pleased that our son could spend 3 years of his life coming to Daisy and we recommend this institution. The Teachers and staffs at the Nursery were very considerate. I felt safe to leave my son at the Nursery. There were no big complaints in the past one year. My sons language skills have mushroomed and Nurseries structured approach phonics is providing him with a solid base that he could build on in reception. Jeremi had started to attend Daisy Nursery when he was 11 months. Throughout a few first days he has an adaptation program, after which he stayed with no problems. I felt like everything was well organized, well thought through, I could see the years of experience. The ladies working were nice, kind and understanding, I felt safe to leave my son. Jeremi has learned to share his toys, interact with other children and mind the smaller children. We recommend this place with all our hearts. We are very relaxed when Advik is in the Nursery. He was always interested to go to the Daisy and interact with Aunties and play with other kids. He learned so many new things and English words and usages that even surprised us some times. We are very happy about your service. Thank you very much for taking care of Advik. 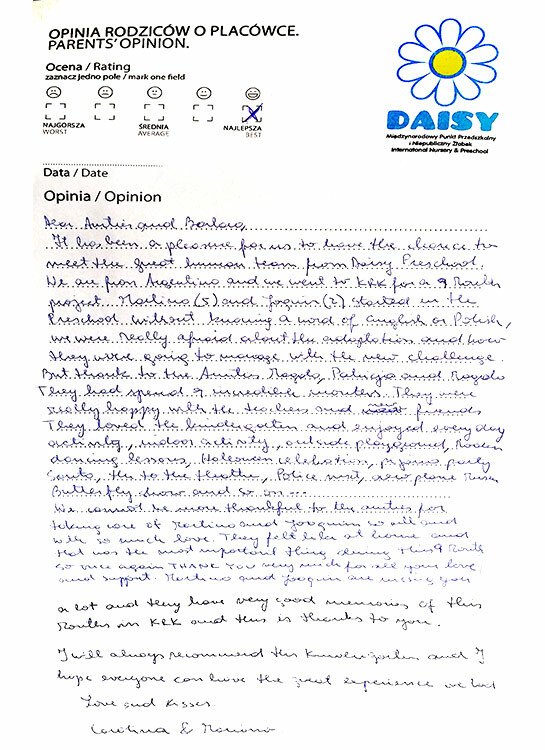 Daisy is a very good option for foreign parents mainly because of English speaking. We felt very good and confident to leave our child with the Teachers at the Nursery because they were always really kind to Giovanna. Also the food we think was very good because Giovanna always ate well. Thank you for everything and hopefully we will refer Daisy to other people. Although I remember that he seemed to be unwilling to leave from Dad/Mum for first few months, now he goes to the Nursery smiling almost every morning. He surely likes the Nursery and the Teachers. He seems to be able to understand English. It will be great help for him in the future. We thank Teachers for taking care of Ryota safely and educating him. The Daisy Nursery was a wonderful place for Julek. During a few months he has learned so many things that is difficult to name them here. The Aunties were always tender and were always informing us about how Julian’s day went by. Julian had made friends in the Nursery with the kids and became more open and communicative. The aunties tried to take the children out for a walk every day, they created good conditions for the children to develop their abilities. Julian was always well taken care off, and after the adaptation period always smiling. We recommend the Daisy Nursery, where children in natural and happy way can learn what life is like. Thank you for the beautiful months we spent together with Daisy. 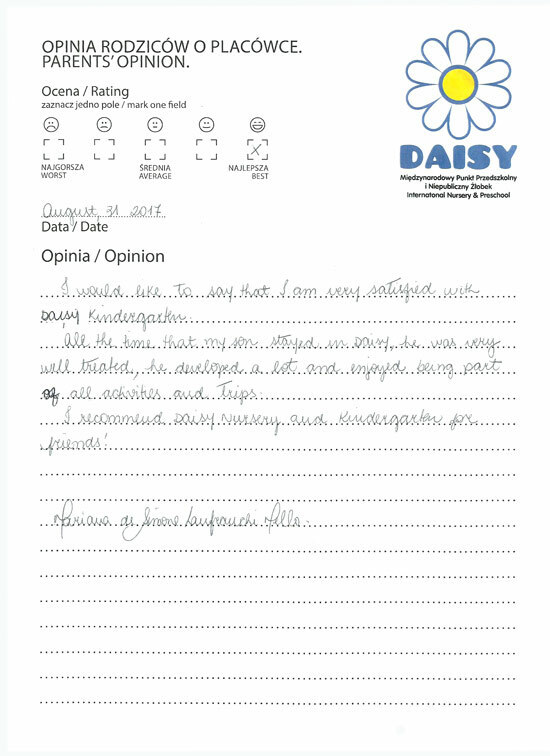 I would like to say that I am very satisfied with Daisy Kindergarten. All the time that my son stayed in Daisy, he was very well treated, he developed a lot and enjoyed being part of all activities and trips. I recommend Daisy Nursery and Kindergarten for friends! With a clear continence I can recommend the Dais Nursery to each parent. Rozalka attended it for more than 1,5 years. She adopted quickly and she was always keen to go there. We liked the everyday contact with English, (that my daughter learned a LOT) children from different countries, variety of very interesting activities, young and kind employees. A big plus is the quick and good contact with the Nursery owner for the administration matters and with the aunties in everyday matters. We will have good memories of the time my daughter spent at Daisy. It was the best choice we could have made for Emilie. The Aunties Magda & Patrycja are doing a great job and putting a lot of attention and care to the children. Emilie learned a lot over these 1.5 year spent at Daisy’s. We appreciated the organization of all side activities, helped her to discover the world and new hobbies like climbing and dancing. it’s great to have photos of all these events. We know it’s a difficult job and we are very pleased with the way you are doing it. You have found a good formula and balance for the children. Thank you and your team for all of this. Kuba, thanks to the tender aunties, thanks to playing in a group of children, thanks to singing, eurythmic lessons, painting etc soon became a “little pre-schooler”. In one word, enrolling my son to Daisy was a great decision. The aunties are warm, involved and creative, they helped Kuba in his development, his adaptation process, his independence training – by repeating everyday routines like brushing teeth, toilet routine, tidying up the toys. I know that after Daisy my son is ready for the next step which is going to a preschool. Now it is time for goodbye – it will be very difficult for us, so at the end, together with Kuba, we would like to thank the WONDERFUL AUNTIES for these 2 years. I recommend Daisy to all the parents that think of enrolling their child to a Nursery. I really like the approach of the Aunties to the children - the warmth, tenderness, and that they hug children often. This fact makes the adaptation for the children easier and because of this they like going back to the Nursery. The additional activities for the children are nice, Theatre, visits of interesting people, social events. During the time when my child was attending the Nursery I was treated with kindness and what is very important, with understanding in many situation. I would like to thank for that the aunties and Mrs Basia! The Daisy Nursery for us as parents and Pola was an amazing place. Our little baby here for the first time stayed alone without mummy with unknown persons and started to learn how to cope in a group. Thanks to the support given especially in the first weeks to me as the mother, the warmth and the endless patience showed to the children by the aunties, our daughter has grown to a courageous and wise girl. A great place for all children. I recommend it and thank for the wonderful care. Since joining Daisy Preschool my daughter has developed in so many ways. She is more confident and balanced and looks forward to into Preschool every day. Our daughter has had the most amazing time at Daisy Preschool. She has lots of fun and bright environment. My daughter loves the Teachers very much and Teachers are very approachable for parents. 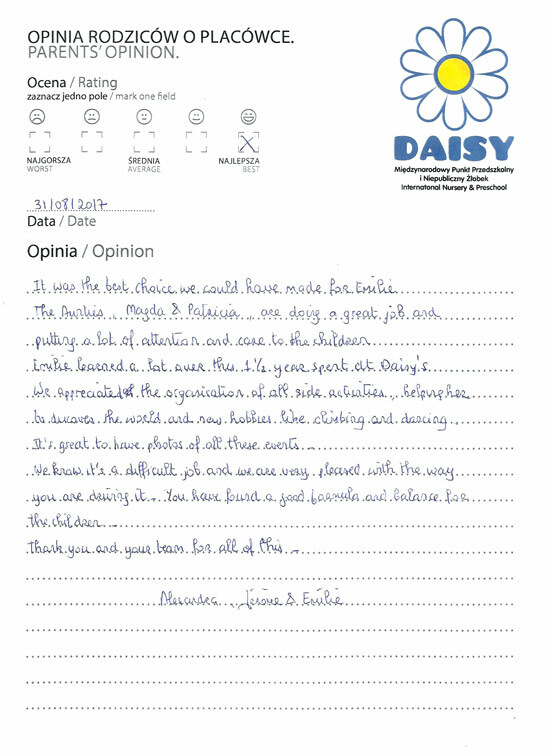 Our experience of the Daisy School was very fantastic and we would definitely recommend to others. Choosing the Daisy Nursery was one of the best decisions regarding the care and upbringing of my daughter. The vast amount of love, warmth and happy moments that Liliana received from each one of the aunties was much more than I could have ever expected. I would like to thank for this with all my heart! Thanks to your care and gaining new abilities from a toddler she became a witty girl ready for new challenges – like Preschool. The bilingual English learning shows the effects already. Liliana in a natural way used English in everyday life. The best proof of my daughter’s joy that going to DAISY Nursery gave her is the constant smile on her face!!! Thank you again. I recommend the place with all my heart. I recommend Daisy to other parents because I saw how the stuff I committed with the children and how the children change when they start coming to this Nursery. My son had a difficult adaptation period in the beginning but the aunties have never gave up on him and he felt very good and loved by them during these 5 months. Pedro have developed himself very fast and learned lots of good things In the Nursery. I really appreciate all the moments we spent together and all the steps we have faced with Pedro I am very satisfied! Thanks to all the aunties and Barbara for everything! Hope to keep in contact as he goes to Daisy Kindergarten. As parents of a child who attended Daisy - International Nursery for almost two years, we recommend this educational institution to every parent. Daisy Nursery has smiling “aunties” who provide good, professional and thoughtful care. We make sure to provide everyday care for children’s hygiene because it influences their health. Due to the support of “aunts”, making our son Maksym to use knickers instead of nappy went smoothly. Daisy Nursery takes care of comprehensive child’s development along with offering dance lessons, art classes, pottery lessons and the basis of English. An additional asset is creating main events and birthday parties as well as taking pictures during these events by this institution. An extremely important aspect is also providing tasty diversity of meals including individual needs of a child. Moreover, Daisy Nursery offers the care of a psychologist, speech therapist and physiotherapist along with providing reports about child’s development. A nice custom is informing everyday about daily routines. Dearly we would like to thank every “aunty” for taking great care of our Maksym. Even today we would like to place our next son in this educational facility. 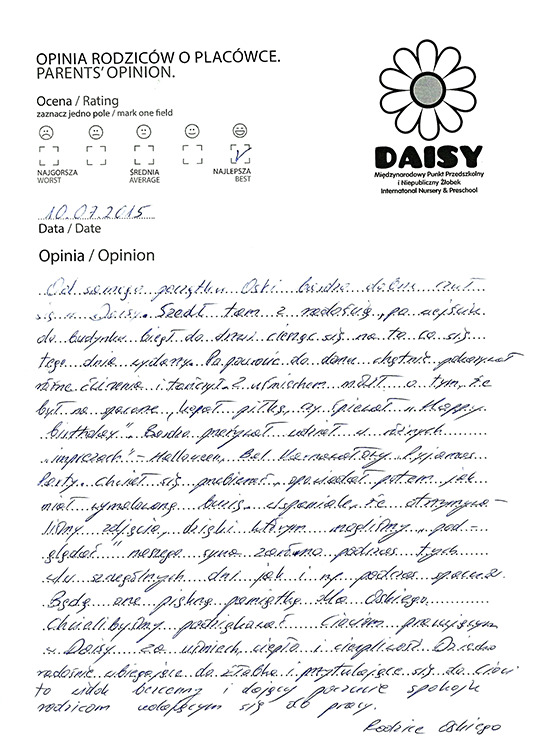 It is hard to express our opinion about this preschool, “Daisy” in just a few words. The best recommendation is that our daughter, Milenka who has attended the institution from the age of one until the age of five, enthusiastically ran to her preschool every morning with a smile on her face. After, she would joyfully speak of the experiences she had at the preschool when she returned home. She was taught many valuable skills (she easily communicates in English with other people, dances, sings, forms figures out of Play-Doh, and etc.). The athosphere in this preschool is unique; “aunts” are always happy and smile all the time, they are open to the children’s needs. They will always find time to talk about a child, shatter any doubts as well as answer any questions that the parent may have. As parents, we appreciate very good and direct contact with preschool management. The well-organized, wide variety of extra attractions and field-trips will definitely suit anyone especially the most demanding parents. We are going to miss this preschool and we will always warmly think about the past four years together, first “aunties” and first friendships. And the most important – the stuff of the Nursery! Competent and very kind “aunties” with a fantastic approach to children and a professional owner of the Nursery. Anastazja spent 2 years at Daisy (6 month in the Nursery and 18 months in the Preschool). She was always happy, joyful, she willingly attended the Preschool and developed her skills. She always spoke warmly about her Teachers “Aunties” ☺ missing them during long absence times. The Preschool gives opportunity to learn English, participate in dance classes, eurhythmics, manual skills, children are looked after a psychologist, speech therapist and professional Teachers. I am very grateful to the “Aunties” :) for their patience, empathy, commitment and help in upbringing of Anastazja during these 2 years. It has been a pleasure for us to have the chance to meet the great human team from Daisy PreSchool. We are from Argentina and we went to Krakow for a 9 month project, Martina (5) and Joaquin (2) started in the preschool without knowing a word of English or Polish, we were really afraid about the adaptation and how there were going to manage with the new challenge. We cannot be more thankful to the aunties for taking care of Martina and Joaquin so well and with so much love. They felt like at home and for us that was the most important thing during this 9 month. So once again THANK you very much for all your love and support. Martina and Joaquin are missing you a lot and they have very good memories of these incredible 9 month in Krakow and this is thanks to you. I will always recommend this kindergarten and I hope everyone can have the great experience we had. We are French expatriates in Cracow and we were looking for an English speaking Nursery for our little Emilie. We found Daisy on the internet. Emilie started the Nursery at the age of 10 months. At the beginning we were a little bit anxious but it went very well thanks to the attention of very dedicated “Aunties”. Emilie discovered a new environment and she loved it. She was always happy to go there in the morning. She went there until the age of 2 and half and she moved recently to the Daisy Preschool at Krymska street. We highly recommend Daisy Nursery School without any hesitation and we thank a lot all the Aunties who helped Emilie to discover the world and grow. Yejun had a great time at Daisy. Thank you so much! And there are lovely Teachers here. Thanks for taking care of Yejun well. Yejun was happy in here. We couldn’t have dreamed of a better place for our son’s daycare! The kind, always smiling, competent and professional Aunties take very good care of children and create fantastic atmosphere. During our 1,5 year adventure with the DAISY Nursery Adas from day to day was becoming more independent, developed speech and communication skills, learned how to play in the group and made first friendships. During the difficult moments we could always count on support and good advice. My child attended Daisy Nursery for 2 years, since he was 11 months old. Thanks to the well planned adaptation program Oskar adapted really fast and felt in the Nursery like at home. Putting Oskar to the Nursery I knew, that he was safe and well taken care of there. The huge advantage of the Daisy Nursery are the genuine international environment and cozy, home atmosphere that I would like to thank for all the aunties, especially auntie Magda. If I were to choose the Nursery for Oskar again, I would for sure choose Daisy Nursery again. Daisy was recommended to us by our friends but despite that we still had doubts: how our son will cope? How is it going to be there? What are the carers like? In the Nursery it came out that we had met very kind, warm hearted, positive aunties. They were the ones that from the very beginning took wonderful care of Franek, and made the adaptation painless, for Franek and for us parents. Daisy is a magical place that thanks to its wonderful atmosphere created by the aunties, gives sense of security, Franek could always count on help in difficult moments. There is no better proof that the Little Man feels good in a place than the fact that she goes to the Preschool with joy and pleasure. For us parents it is priceless to feel that Sonia from the moment she entered the Daisy Preschool door was surrounded by care that guaranteed safeness, easy communication with the educators “aunties”, their commitment, individual approach, an excellent organized education program, the variety of activities like ballet or dancing, group trips, visits of interesting people, independently prepared shows for Grand Mother and Grand Father’s Day , Mummy’s and Daddy’s Day – it all was beyond our expectations, in addition, the English language education. WE CONGRATULATE ON CREATING A GREAT ATMOSPHERE OF THIS PLACE AND BUILDING AN EXCEPTIONAL TEAM OF EDUCATORS – AUNTIES LOVED BY ALL CHILDREN!!! From the very beginning Oski felt very good at Daisy. He went there with joy, just when he was entering the building he was running to the door being happy on the things waiting for him that day. After coming back home he was keen on showing exercises and dancing. With a smile on his face he was telling that he went for a walk, was playing football, or singing “Happy Birthday”. He was very emotional about the events like Halloween, Fancy Dress Ball or Pyjamas Party. He wanted to dress in the party clothes and then was explaining how his face was painted. It is wonderful that we were receiving photos , thanks to that we could see our son not only during the parties but also during the walk for instance. The photos will be a beautiful memory to Oski. We would like to thank all the Aunties that work at Daisy for their smile, warmth and patience. The child happily running into the Nursery and hugging the Auntie is the priceless picture that gives the going to work parents’ inner calmness. We would like to thank everyone at Daisy for their hard work and dedication! And most importantly the love for the children. Julie loved going to Daisy from the moment she first went there at 11 months of age, until today at 3,5 years of age. She learned many things like English and Polish, songs, counting in both languages and playing in a group. The trip to the botanic garden and candy factory were also very popular. I like that she was fully accepted being from a foreign country. To Julie Daisy is her second home and she will miss all of you very much! And so will we! Thank you for being such a significant part of her life and giving her the feeling that she is loved and accepted by all of you! We have been very pleased to have our daughter- Linnea in Daisy Nursery. The facilities and activities have all been great, but the best and most important thing is the dedication and the affection that the aunties always show the children. We always felt sure that Linnea would be taken good care of and that any special needs she might have would be taken care of. As expats in Kraków in ment a lot to us to know that we found a good Nursery for our daughter, right from the beginning of our stay here. We will miss you all a lot! Sonia attended the Daisy Nursery from August 2012 when she was 20 months old till August 2013, with all the responsibility I recommend Daisy Nursery. When I first left my daughter there I felt anxiety. But it came out that my worries were unnecessary. Sonia from the beginning liked her new aunties and always went to the Nursery with pleasure. She learned many things, that we wouldn’t be able to teach her, if she only had stayed with us at home. She became very independent, friendly, and open to others. We were very happy to find out, that Sonia being almost three years old, could continue her education at Daisy Preschool. A big advantage of the aunties at Daisy is their creativity and commitment in play and care. I heartily recommend this place to all parents that are looking for good daycare. We thank you very much for your wonderful care, that you gave to our daughter Anastazja. 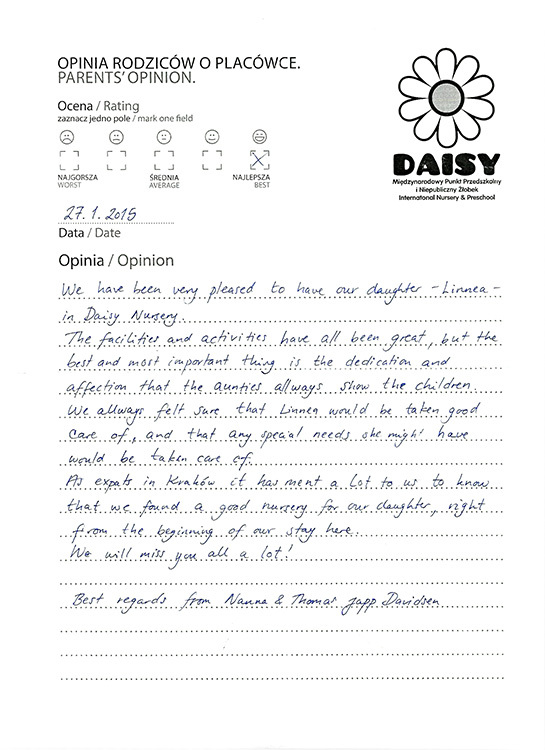 Ana spent 6 months at DAISY, thanks to your tender care, involvement and support these were very joyful moments for her. Very kind and professional personnel, wonderfully decorated rooms, variety of educational activities and attractions will make us remember this place with joy. Moreover very interesting activities and social events diversified each day for children. 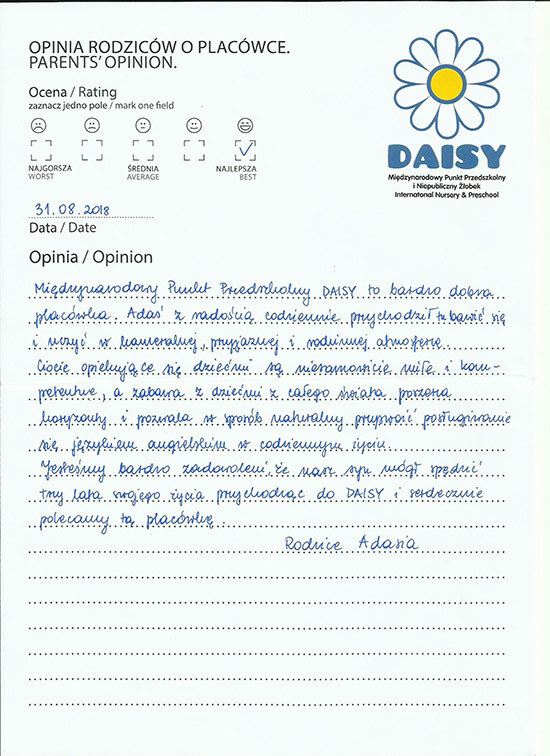 In Daisy Łucja was not only having fun, but also she gain many important verbal, motor and emotional skills. Thank you very much once again for everything. I don’t know a place that is better for a child than Daisy. Łucja adopted in Daisy very quickly and this happened thanks to the wonderful Aunties (Aunty Madzia, Monika and Patrycja) that gave her plenty of patience and kindness. Łucja always felt in Daisy like at home. 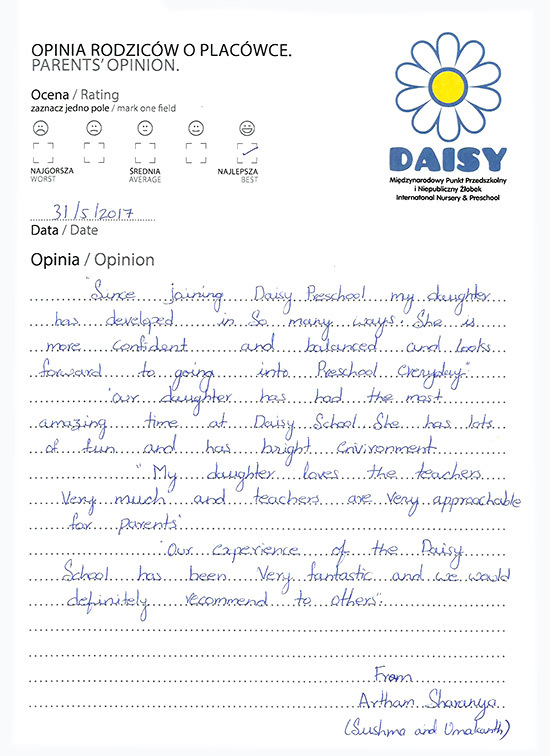 It is a pity that not all of the parents have the opportunity to send their children to Daisy. We thank for the wonderful care that was given to Tomek. Each day was a pleasant experience. Tomuś learned many important things – how to play in a group, how to care about tidiness, how to eat by himself. Every day we were informed about his development, about how his day had been, these was very precious information for us. Variety of activities – music, dancing, ceramics – were additionally stimulating his development. Especially at the beginning of the attendance to the Nursery, when Tomuś was very small, we could count on individual approach and care of one Auntie. This allowed Tomek to adjust quicker and easier to the new environment. Tomuś attended the Nursery with pleasure every day. Even at times that he didn’t want to separate from his parents, the aunties professionally took care of him so that he didn’t feel stressful. Wonderful and professional care of the Aunties, differential, interesting and (according to us) very valuable care and educational program prepared and carried out by Mrs Basia, colorful and joyful rooms – this is all that gathers into the image of DAISY that we will keep in our minds. With sorrow we say good-bye to the Nursery – unfortunately it is time to go to preschool. Tomek, just as his old sister Kira, spend wonderful 2 years here at DAISY. Sending Ula to the Nursery was not an easy decision for us. However, when we saw her waking up so eagerly in the morning and going to the Nursery, we understood we did the right thing. The care and warmth that she was surrounded with made her adjust to the new place very quickly (the adaptation week lasted just for 2 days in our case), she gained self-esteem and learned many useful skills. The individual approach to each child, the variety of activities at the Nursery was a reason that Ula was never bored at Daisy, she always came back joyful and many times she didn’t want to leave the Nursery at all. The experience she gained at Daisy for sure was a big impact on how quickly she adjusted to the kindergarten, her new aunties are very fond of her being independent just being 2,5 years old. The big and important role that you Daisy played in our child’s life can be understood by the fact, that despite Ula does not attend the Nursery for quite a long time now, she still remembers with a likening her beloved aunties. With all our hearts we can recommend Daisy to all the parents. We hope, that after some time there will also be a place for our little son at Daisy. My daughter has been attending Daisy Nursery since May 2013. Enrolling the child to a Nursery was quite a difficult decision for me. I didn’t know how my daughter would find herself in a new environment and how she would handle the separation. Now I think it was a very good decision. Natalka has grown up, developed her manual skills and developed emotionally. At the Nursery she has her favorite “aunties” that are always kind, smiling and open. They took care of Natalka, looked after her. Every day I received a feedback on how my daughter was, if she had fun, if she slept, what she ate and how she was feeling that day. My child always comes back form the Nursery happy and smiling and that is the best recommendation. I thank all the ladies for all the effort put into the upbringing of my beloved child. We recommend Daisy International Nursery to all parents that want to have appropriate and professional care for their children. From the very beginning we were enchanted with the Nursery, when we first visited it with my husband. The Nursery ensures safeness and professional care. All the Ladies “Aunties” are very nice, warm and kind. They are professional and in addition to that they all have wonderful approach to children, they are patient and big heart for them – this was the key element to our decision about choosing this Nursery for our daughter. Emilka spent her time there willingly and we as parents were sure, that our daughter is in good hands. Moreover what was important for us was for our daughter to be around other children, this is important for the general development of the child. The Nursery strongly cooperates with parents which is a huge advantage because everything is being consulted. In addition to that there are specialists like a rehabilitation specialist, child psychologist that follow the development of the kids and share their professional opinions with parents. Parents can be sure that their children will not be bored thanks to the variety of activities organized by the personnel of the Nursery, there are also many social events like Santa Claus or birthdays organized. We thank all the Nursery staff for the care and heart shown to our Emilka, we believe, that it was one of the best decisions taken by us. We will always be grateful and we will surely tell Emilka when she is bigger about the Aunties and children that she spent nice moments with. It wasn’t an easy decision to put our daughter into a Nursery. We had vast concerns if our daughter would receive good care, but just on the first day spent at the Nursery we were certain the concerns were unnecessary. Each next day was the proof, that choosing Daisy was w good decision. The “Aunties” made a great impression on us. They are people with contribution and big hearts for children. They are happy to give advice, but at the same time they are open for suggestions and requests. It was nice to observe them taking care of my little Alusia with care and attention. The individual approach to each child, the independence training, training of good habits like washing hands, brushing teeth, using the potty and additional activities like music and eurhythmics, ceramics activity, the care of a speech therapist, rehabilitation specialist and a psychologist are the advantages that give a perfect development opportunity along with your child being under very good care. We would like to very much thank for the fact that we didn’t have to worry about what is happening to our daughter while we were at work, it is because we were sure, that Alusia is happy at the Nursery. Thanks to your loving care, involvement and professional approach to our son he not only adapted well to Daisy, he learned to play and cooperate in the group but also acquired many useful skills. 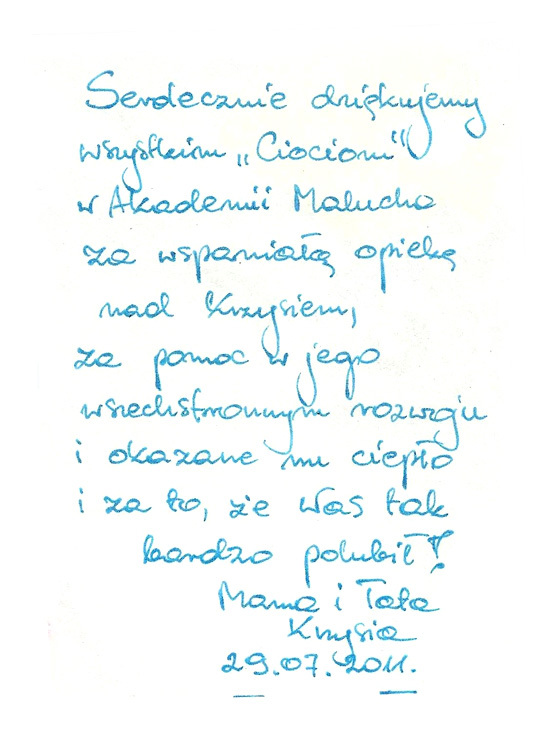 We are very glad with the activities of sustainable arts and language, after which Kubuś sometimes surprised us with the understanding of whole sentences in English and responding to them, often also in English. Never to be forgotten are the dances and, of course, auto repair garage. We are very pleased with these almost 2 years cooperation between the staff and us took place without any problems. And although sadly we leave daisy thresholds, we are confident that our son is entering the next stage of his life with excellent preparation. We would like to thank all the great aunts and recommend DAISY!!! Our daughter started at Daisy, when she was 1,5 years old. The beginnings were difficult especially for mummy, because Michasia was quick to adopt and was open for new experiences. 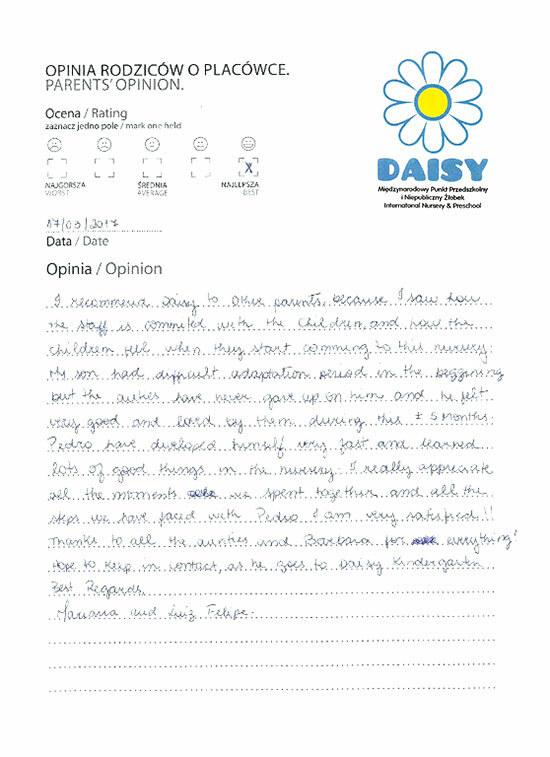 Attending Daisy for 10 months positively influenced the development of self-independence, speech and vocabulary, manual functions and higher cooperation with other children in the group. In was very valuable to get help from speech therapist and rehabilitation specialist. Worth mentioning are also suitable opening hours of the Nursery – starting from 7 am. We would mostly like to thank for supporting the self-independence training of our daughter – especially during the time of eating, washing hands, brushing teeth, tidying up the toys, and recently saying goodbye to the diaper and starting to use the toilet. We thank all the aunties for good care, paying attention to the details and for child’s good being the priority and most of all for the information that each parent likes to hear – how the child has spent the day. We recommend this place to other parents, it’s a place full of dedication to our treasures. Mila’s experience at Daisy could not have been better. She loved all of her “ciocias” and made many close friends whom she spent time with outside the Nursery as well. As her mother, I highly appreciated the close care Mila received at Daisy which I feel she would not have received at other Nurseries. I loved that everything was documented, from the way she slept and ate, to how many times she used the bathroom. Every day when I picked up Mila, I saw the love she had for her Teachers, and the love they had for her. I never had to worry, I always knew Mila was in good care. Mila’s language also developed significantly, at Daisy she came home singing songs in English and speaking in full Polish sentences! We will really miss Daisy, and are sad that we will not be continuing preschool with the institute, thank you very much for teaching and caring for our daughter. We would like to kindly thank Mrs. Barbara Kulaç and her all staff for the care, heart and dedication given to our daughter. After the first few hours at Daisy International Nursery I knew, that this would be the place where our daughter will feel like AT HOME. 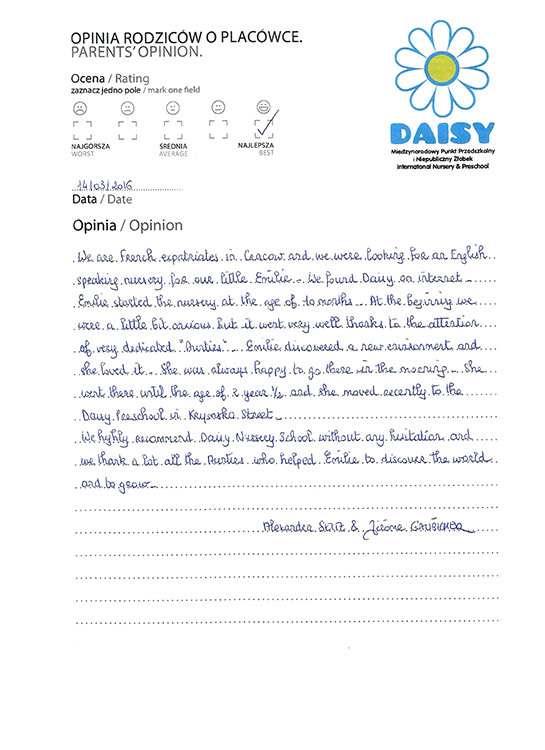 The Daisy’s standards, atmosphere and the care at Daisy are at a very high level. The AUNTIES showed wonderful tenderness and care. Oliwia learned so many things while coming to DAISY (washing hands, brushing teeth, tiding up the toys etc). Together with the AUNTIES we worked over getting off pampers. What we are mostly happy with is the self- independence that Oliwia gained, the willingness to play in a group, the care she shows to smaller children and most of all the knowledge of English (she knows colors, animal names, numbers till 10, the alphabet and many songs). Our daughter went to DAISY with joy every day, she always came back home with a smiling face and full of new experiences. Soon we will start the new education level and I hope that Oliwia will be developing as great as she did with the help of Daisy International Nursery staff. Our son attended Daisy for over a year, he started when he was 22 months old. He soon started to use the toilet, eat by himself. 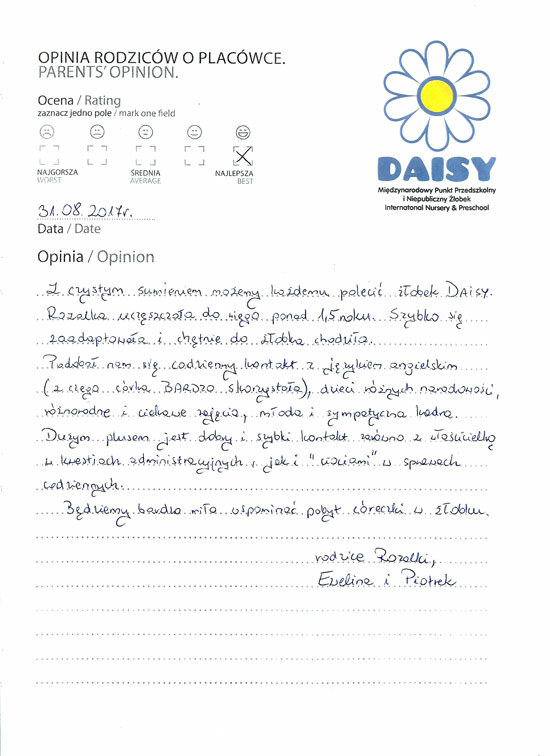 A very interesting offer of Daisy Nursery, competent and nice aunties made Michałek quickly learn new words and later on phrases in English. Our son enjoyed himself in Daisy, it was very important, because he went there willingly every day. We are very happy with the decision about Daisy and Nursery itself. We are very happy about our decision to send our son to Daisy International Nursery. Bartuś spent almost 2 years in this Nursery, he was surrounded with tender care of nice “Aunties” and he adopted to the place well. The adaptation of the child to the Nursery is well - organized, the child willingly enters this new and at the same time difficult stage of being separate from parents. We very much liked the education methods at Daisy, they let the child to learn discipline but also help to develop through playing. 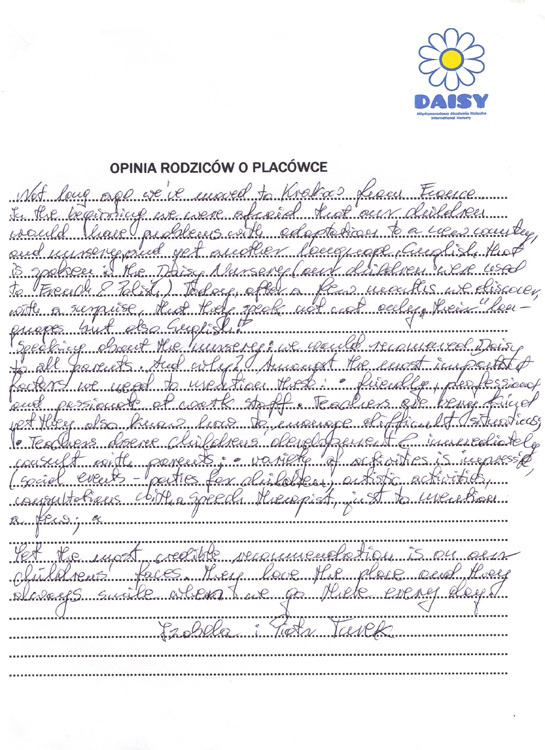 We are also surprised about the great amount of words in English that Bartuś learned. We would like to heartily thank for all the contribution into the development and education of the Aunties that took care of our son. We recommend this Nursery to all parents. We started the Daisy adventure when our son was 15, years old. The beginning was difficult (especially for the mummy) but Antoś quickly adopted and started to like this place. When he asked us one Saturday why we were not going to Daisy? We knew that sending him there was a good decision. The place is wonderful!!! Full of love, understanding and respect for children. Most of all the beloved Aunties deserve warm words. They are always smiling, dedicated to children, knowing their individual needs and most of all always full of warmth. The feedback information about our son was always exhaustive, our requests always put into place. The cooperation with Aunties was a great pleasure. Dear Ms Sokolovska, Dear Daisy girls. We are very pleased with our daughter’s stay in your nursery. We are very happy we have entrusted our most valuable treasure in your hands, because we have received understanding, support and peace of mind. We have received a warm welcome and a heartfelt good-bye. Maria-Simona loves everyone there and made many friends with which she continued playing even at home. In addition to the warm and friendly atmosphere, our daughter could learn and develop thanks to the work done by the nursery girls. 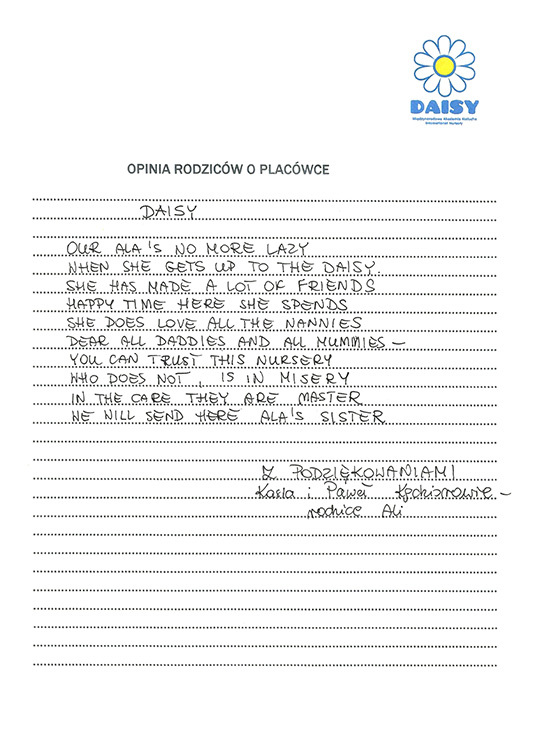 You helped her a lot to get used to the new environment in Poland and we were surprised to see the nursery girls from Daisy dealing better with Simona in some situation than us. Please accept our warmest gratitude and congratulation on the good job! We wish you all the best and hope to see you again! We would gladly recommend the Nursery to every parent and if need be, we will not hesitate to send our daughter again to Daisy! I would like to thank Mrs Barbara and all the aunties, that by their tenderness and warmth that was felt by each child, they created a second home for my daughter Ania. Every morning when Ania woke up she was happy “to go to kids”. We as parents were able to peacefully go to work being sure that Ania feels great at DAISY. I am very happy that Ania developed and discovered the small and big miracles of this world at DAISY. On behalf of Jaś and our own, we would like to thank the whole crew that creates Daisy International Nursery for the heart inserted in the care of our son who attended the Nursery for the past two years. Gratitude to all Aunties who take care of the little ones, watch out for constant development of their toddlers with dedication and patience and at the same time Aunties do not forget to smile. Special thanks to Mrs. Barbara who has created such a unique place that Jaś was happy to come to, where the time that he spent was organized in an interesting way, in the atmosphere of warmth and affection, and where parents know that their child is under good, professional care. Now we begin the next stage of education. At the Nursery Jaś was well-prepared to undertake the challenges in the kindergarten, where he is praised for self-reliance and easy-going. We remember Daisy with great fondness. It was a really special time for us. We would like to thank you and wish as many smiles on children's faces as possible. Ewa & Przemek – Jaś’s parents. Paul has been attending the nursery for over a year and a half. We were really happy to place Paul in Daisy as we believe that staff is really nice and full of competences. As a foreigner, it was a great added value that Paul could speak English with his nannies. I am sure he will be missing all of them. I do actually highly recommend Daisy International for their professionalism, but also for the nice atmosphere we could notice each time we picked up Paul from the Nursery. The entire team creating Daisy Academy showed very high qualifications, preparation of substantive as well as practical while taking care of our son Olivier. At the beginning - this particularly difficult adaptation’s stage of the child - all the aunties have shown great tenderness and protectiveness toward our son. Referring to the preparation, while the academy staff demonstrated professionalism, implementing established curriculum in the language, manual, as well as supporting normal physical development of the child. We would like to emphasize that our son Olivier smiling for their favorite aunties developed the ability to speak, "painting" and carry out daily activities independently. In our opinion, the Academy staff with a very high personal culture, as well as adequate education, transforms the everyday but how difficult work with children - into some kind of a COLORFUL adventure that certainly will be remembered by Olivier. 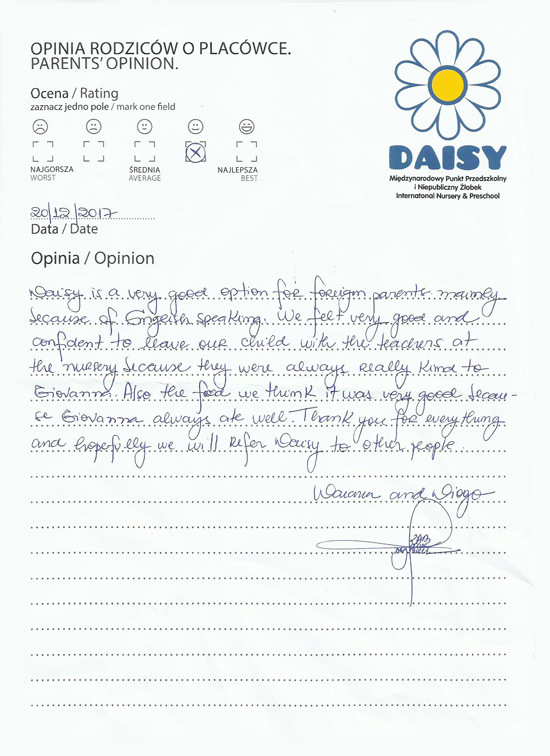 We would like to thank all the staff of Daisy Nursery for the everyday care of our son Bruno. The ever smiling, happy and lovely “Aunties” have made Bruno feel secure at the Nursery; he came back home satisfied and “well amused”. The Nursery is very well organized, the hygiene, variety of games, entertainments and activities are made with a very high standard. We highly recommend this place to parents, who look for daycare that is full of safety, heart and individual approach. We are the parents of 3 years old Tola, who started to attend to Daisy when she was 13 months old. Initially our daughter was in Daisy two days a week and three days she was under the care of nanny. However, after few months she preferred going to Daisy than staying with her babysitter although Tola really liked her. Despite being concern about infections and Tola’s whole-week-stay in the nursery, we decided to send her to Daisy. Today, in retrospect, we feel a bit of regret that we didn’t decide to take this step earlier. Thanks to Daisy, our daughter became much more independent, open-minded, willing to play in the group, able to share toys. In the nursery, she learnt how to use the toilet; self-feeding and she dropped a tummy. At the age of 2 she was better in counting to ten in English than in Polish, she names the colors only in English, knows many English names of animals, songs, rhymes and phrases. She can even sing the whole alphabet in English. Our child willingly went to the nursery every morning. Sometimes she even would like to go there on Saturdays. Whenever I picked Tola up from the Nursery she had a smiling face and she was full of new experiences. I think there is no other facility like Daisy – so professional, with the commitment and individual approach to children, and one auntie for 3 kids is already a sensation! Daisy has only one minus, sets the bars very high and this is really hard to find kindergarten fully meeting the standards of Daisy. If you have an extraordinary child, we recommend you an extraordinary Nursery. I am a mother of Ewa, who started to attend Daisy International Nursery when she was one year old and she stayed there until she was ready to go to the kindergarten. Hygiene is maintained at high level at the nursery. Ewa never diaper rush and, what is the most important, she was rarely sick. My child has acquired the habit of washing her hands after walks and meals and she was taught peeing on the toilet before she was two years old. At Daisy activities are very good. Especially I had to express my approval for English and art classes, ex. Ceramics activity. My daughter was keen on spending time in the nursery and she had very good relationships with her teachers – ‘aunties’ , who have always openly responded to my suggestions and comments. This is a place worth recommending. For a really long time we had been looking for a suitable place for Olcia . The place, where she would be safe and spend a great time during our work. We visited many institutions but we didn’t decide to any of them. When we got to Daisy, after a brief conversation with Mrs Basia Kulaç , we knew that we finally found the perfect place for our daughter. Ola accustomed for two weeks, but thanks to constant contact and care from Mrs Basia, we knew how to adapt and behave. Giving Ola to Daisy, we were sure that she is not only playing and having wonderful time with children but most of all – the real specialists take care of her – Aunties are invaluable, trustworthy, have the patience of the job – kids love them! Everything is perfectly organized, prepared and thought out in Daisy. Many interesting activities and games, and all of this in really home atmosphere. Thanks to that, Ola has strong basis for putting a brave step in kindergarten. We are grateful to the entire Daisy’s staff for their work and dedication, for the kind words and for having created a second home – so much liked by Olcia. We will be in touch definitely, because we know that all the dear Aunties are interested in the fate of children. Bruno had started his adventure with Daisy when he was only 8 months old and he was the youngest child then. As his parents, we were full of anxiety to enroll our only child anywhere. Our doubts disappeared very quickly though after we were welcomed by nice and friendly aunties. Our baby spent one year in Daisy, a year that was very important for him. He has developed in an amazing way and we could observe that every single day. What is more, he learnt a lot in the Nursery. We truly recommend that place to all parents. Especially if you don’t know what to do with your infant. Home atmosphere and professional attitude are the biggest advantages of Daisy. Thank you sincerely for all those emotions and beautiful moments that Bruno experienced with you and for the attentive care every day. At the very beginning I would like to thank for the marvelous care Tymon has received at Daisy. From the very first visit I knew that the Nursery is professionally prepared to take care of my son (who was only almost just a year old). Hygiene, safety and the loveliest aunties had made me bring Tymon every day to the Nursery without any doubts. I must unfortunately also say, that my child was not very keen to go back home with me after a day spent at Daisy – day full of playing, dancing, songs in English, artistic activities and theme parties like for instance pajama party. I would also like to express my special gratitude to Mrs. Barbara Kulaç, for her wonderful support during very difficult moments and for her help in restraining my little brat. Our daughter Kira was less than one year old when she started her adventure with Daisy International Nursery. Thanks to great care and amazing atmosphere she accustomed to the new place very quickly. At home she didn't want to fall asleep in the afternoon but in the Nursery all of this changed and she felt asleep immediately. A regular schedule helped us with systematizing Saturdays and Sundays. For one year and a half of Kira's attendance to DAISY she really became independent and she also learned how to use a potty and eat by herself. A varied program of activities, lots of movement and rhythm games revealed her passion for dance and music. With a constant physiotherapist's care and contact with speech therapist we were permanently informed about Kira's development, what allowed us to prevent warping feet. Kira began to speak quickly and smoothly. What is more, daily English classes let Kira pronounce foreign words easily. Time spent at DAISY prepared our daughter perfectly to the kindergarten. Thank you - Mrs Basia and all aunties for your commitment and excellent care of our daughter. Kasia and Michal - Kira's parents. I have chosen Daisy International Nursery because the nursery was very close to my home and it had a nice offer. First of all, during my time spent at work I wanted my son to be safe and have a chance to play with peers. Having now just 2.5 year my son knows how to count in Polish and English to 10, uses a few English words and phrases, knows a few English songs. Together with Daisy staff we went through the process of withdrawal of his beloved bottle, diapers, learning regularity in carrying out daily activities and duties (washing hands, brushing teeth, tiding up toys). I have never encountered any unpleasant gesture or lack of understanding on the part of the staff- you can see that they really like their job. I recommend Daisy International Nursery to all parents who are not only looking for child care, but most of all want their child to develop in a friendly environment with wise principles, spending time actively and creatively. Kisses and many thanks to the whole Daisy staff. Choosing Daisy Nursery for our daughter Aurora, was one of the best decisions we have taken, for us and for her, until now. Being foreigners, we were looking for a place, where we could communicate in English and we were lucky to find Daisy Nursery. The atmosphere, conditions and type of education given to her were at a very high level of quality and Aurora had the chance to develop in a very nice way. All “aunties” treated her very nice, with a lot of friendship, making her feel like home. Every morning, our daughter Aurora was very happy to go to the nursery and many times, in the afternoons, she didn’t want to go home. She attended many interesting classes (like ceramics, music, English) and she learned how to do many things on her own (like eating, drinking from a normal cup, getting dressed/undressed, putting& taking off her shoes and she resigned from the nappies). Another great advantage at Daisy is the fact that all children have the chance to learn two languages at once. In the beginning, we thought that it is going to be very difficult, especially that our daughter has a mother tongue Romanian, therefore a completely different language than Polish & English. It was a very pleasant surprise to see that she got accustomed very fast with the other children and the “aunties”. Now after almost 11 months of going to the nursery, our daughter speaks Polish as good as Romanian, she sings and knows many songs and words in English and she even started to make difference between the 3 languages. Unfortunately, time passes very fast and Aurora has to go to the kindergarten, but she has many pictures from Daisy, which will help her to remember the time spent there. Thank you very much for the care, friendship and all knowledge given to Aurora and we highly recommend Daisy Nursery to all parents! Thank you sincerely for the care and work put into Hania's development. 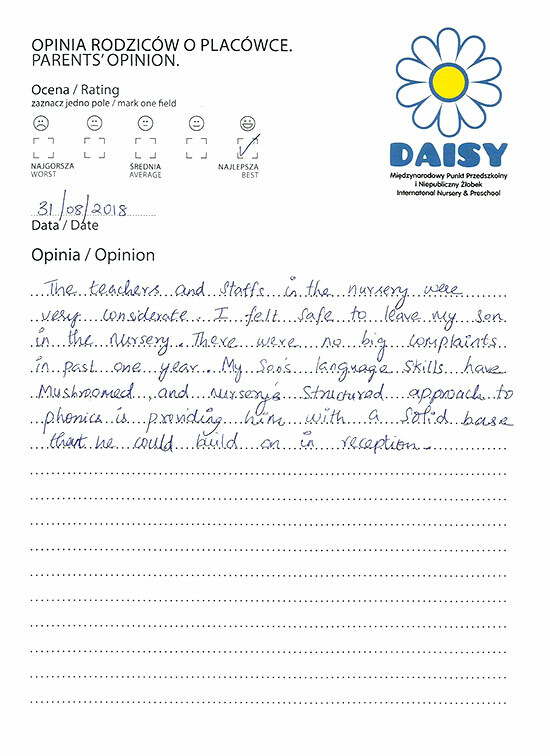 Throughout the period of attendance to Daisy, Hania has developed miraculously. We are pleased with her "knowledge" of English and transition from diapers to potty. All of this would not occur without professional help of aunties and their awareness of Hania's needs. Individual approach to the child makes DAISY the perfect place for the little ones. Julisia attended the Nursery for over a year. 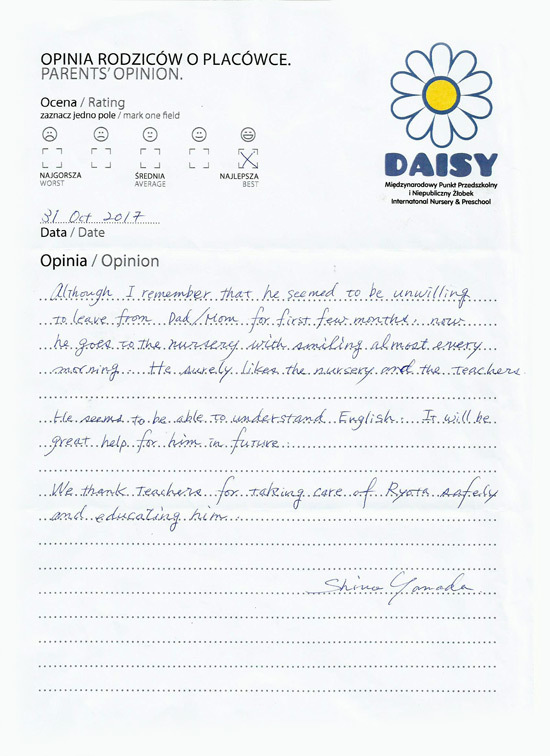 During this time she has shown a huge development progress, she started to talk more, thanks to Daisy she has learned many words in English, she’s learned to count and to sing the alphabet. At home she often talked about her friends and “aunties” from the kindergarten. In short words, a great place. Very clean and organized. Girls very attentive and pleasant. And the best response is to see my daughter happy when she comes and goes. Apart from that the personnel does their best for the children to gain new abilities, therefore they quickly become quite independent. I recommend this place to all parents, and to their children of course. It is the best Nursery in Kraków. I wish all kids in Poland to find a place like that, where love towards children is a priority. A year ago, we realized that Zuzia was getting bored with her nanny. We did not want to send her to a typical “kids’ Club” – meaning a “children’s locker”. After a long internet research we rAn into “Daisy'S” website – IT was so different from the other “kids club’s” websites. The website showed that the owner of the place has a concept on Nursery children’s care. There were rules, rhythm and procedures , activities, care for safety and hygiene. The reality was just as the internet showed ! 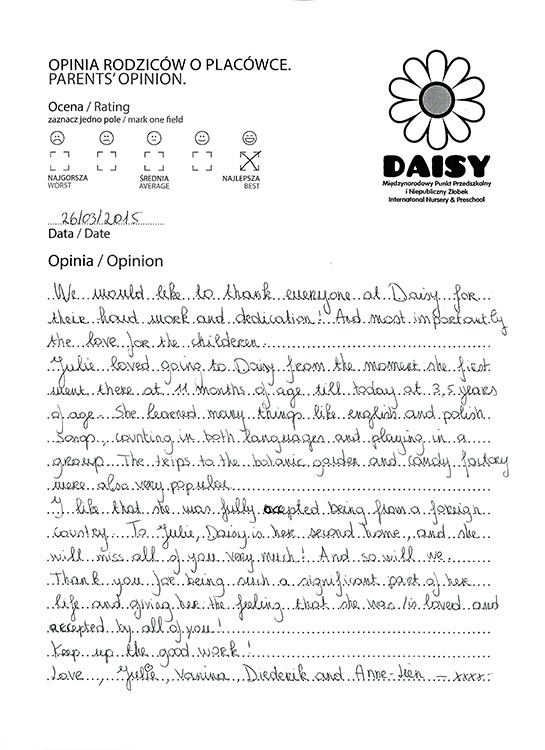 Daisy is a wonderful place made for children with curiosity towards the world. Mrs. Basia Kulaç is warm, joyful and objective, at the same time, with pleasure she would advice "the lost parent" from A psychologist’s perspective. We don’t know how it is possible, but all the “aunties” are warm, smiley and patient. Everything works ! Olivier reaching the age of 2 begun to manifest his own decision making and the desire to interact with other children. That is the time when he started the Daisy Nursery adventure. Slowly weakening, I must say, the symbiotic relation with his mum, he accepted the new place (we started with 2-3 hour separations). I chose this Nursery under the influence of my intuition and we found out it is an interesting place for Olivier. The day at the Nursery is filled with games, physical activities, activities that stimulate the manual functions of the hands – that are so important for shaping the young mind. Olivier was encouraged to perform independent actions (eating by himself, potty training, participating in group activities).He was often praised and this is the easiest way to learn newthings. He took up new challenges to understand the environment and try new things (ceramics and dancing).We are happy we could fill his time during the age 2-3. He spent A lovely time learning. And what would Oli add to this? When he thinks about Daisy – it brings a smile to his face, and he starts stamping his feet with enthusiasm. I highly recommend it! We would like to thank all the „aunties” at the Nursery for taking wonderful care of Krzyś, for helping in his wide development and for all the warmth he received. He likes you all so much! Not long ago we’ve moved to Kraków from France. In the beginning we were afraid that our children would have problems with adaptation to a new country and nursery, and yet another language, English, that is spoken in the Daisy Nursery(our children were used to French and Polish). Today, after a few months we discover, with a surprise, that they speak not only their languages, but also English! 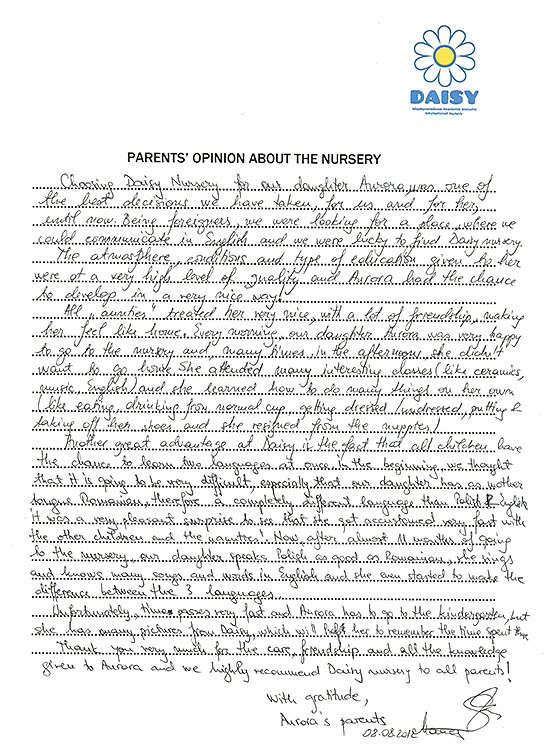 Speaking about the nursery: we would recommend Daisy to all parents. And why? Amongst the most important factors we need to mention these: friendly, professional and passionate at work staff. Teachers are very kind yet they also know how to manage difficult situations. Teachers observe children’s development and immediately consult with parents. Variety of activities is impressive, social events – parties for children, artistic activities, consultations with a speech therapist, just to mansion a few. Yet, the most credible recommendation is on our children’s faces. They love the place and they always smile when we go there every day. The best recommendation for Daisy International Nursery is the fact, that we recommend this place to all of our friends who have small kids. The care at Daisy is professional, full of warmth and commitment. The recipe for a wonderful atmosphere at Daisy is the care for even the smallest details, very kind “aunties” and the individual approach to each child. The variety of additional activities that our son loved IS an extra asset. We recommend this place with our hearts and we greatly thank the effort, commitment and time given to our son.